When editor Lim Nghee Huat, 61, threw in the towel and got into a car at the two-third mark of a 217km run in California's Death Valley last year, his support crew fell silent. Mr Lim already fought back the pain at the 90km mark, when he stopped to ice his right calf for two hours. Encouragement from his support crew gave him the strength to run another 50km in the sweltering heat before he called it quits. His wife Deborah Lim, 56, said: "Nghee Huat never gives up. The pain must have been really bad for him to stop." Among the nine ultramarathons he has signed up for, it was the only one he did not finish. 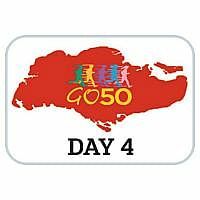 Mr Lim is now attempting the hardest race of his life, running 50km for 50 consecutive days, with seasoned ultramarathoner Yong Yuen Cheng, 43, to celebrate Singapore's 50th birthday. Yesterday, both men completed their fourth 50km run in 7 hours and 44 minutes. Mrs Lim is her husband's chief cheerleader but she was not always supportive of his long-distance running. The Death Valley race, however, allayed her fears that he would one day push himself too hard and ruin his health. "That incident convinced me that he knew how to listen to his body, he knows when to stop," she said. When he started running in ultramarathons, she would tell him to stop as she was worried that running distances of more than 200km, when he was pushing 60, would do more harm than good. "He would always say 'this is the last time', and then go and register behind my back," she said. Fed up, she refused to accompany him to a 2012 ultramarathon in Brazil, hoping this would dissuade him. But Mr Lim went anyway. Mrs Lim paced about the house and could not sleep the whole time. She constantly kept in touch with her son, who went in her place. "After that, I learnt that no matter what, I had to follow Nghee Huat to make sure he is okay," said the mother of three. Now, she is an ever-present figure at Mr Lim's races, attending to his every need. The staunch Christian prepares extra iced energy drinks, suns the wet shoes he changes out of, and even prays for cloud cover during hot weather. Mr Yong's wife, Mrs Yong Pui San, 43, takes a more hands-off approach - she simply lends her husband a listening ear when the going gets tough. "That's more than enough for me," said Mr Yong, who has been married for 12 years. Both Mr Lee and Mr Yong juggle training with full-time jobs. Mr Yong is a teacher. Still, they make time to have dinner with their families at least once a week. "Family support is important, it helps me through tough times," Mr Lim said. After running 50km on the third day, Mr Lim also made the effort to solemnise his friend's wedding in the evening, because he had given his word. "My husband can be a bit passive," said Mrs Lim. "We have been married for more than 30 years but every time he completes an ultramarathon, I feel like he is my hero," she added. Mr Lim says his wife is "God's gift". "I cannot thank her enough," he said.